The PMC-A429HD interface card from Alta Data Technologies offers an impressive 16, 32 or 48 channels of ARINC-429 on a single-width, front panel PMC module. The PMC card can be used in almost any PCI/PCIe based backplane system, and can encode or decode almost any ARINC-429 physical layer signal. The card can also support several 717 channels, and supports Windows, Linux and VxWorks. 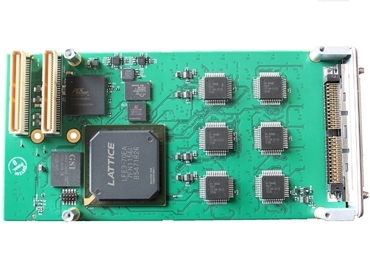 This interface card is based on the industry’s most advanced 32-bit ARINC FPGA protocol engine, AltaCore, and a feature-rich application programming interface, AltaAPI, a multi-layer ANSI C and Windows .NET VB .NET, LabVIEW, RTOS architecture. The card’s hardware and software package provides increased system performance and flexibility while reducing integration time. The PMC-A429HD Transmit (TX) capability includes both simple and complete frequency control options for each channel and Playback and Signal Generator modes. The PMC-A429HD interface cards feature three Receive (RX) functions including channel and multichannel levels; 16, 32 or 48 shared/ selectable RX/TX channels on a single card; O-Scope signal capture on the first two RX channels; advanced TX scheduling - each channel independent; 3 RX modes for each channel; support for hardware and polling interrupts; AltaView Analyser and AltaAPI Windows; and Linux LabVIEW Software Development Kit (SDK) with over 100 example template programs. Alta Data is represented in Australia and New Zealand by Metromatics .